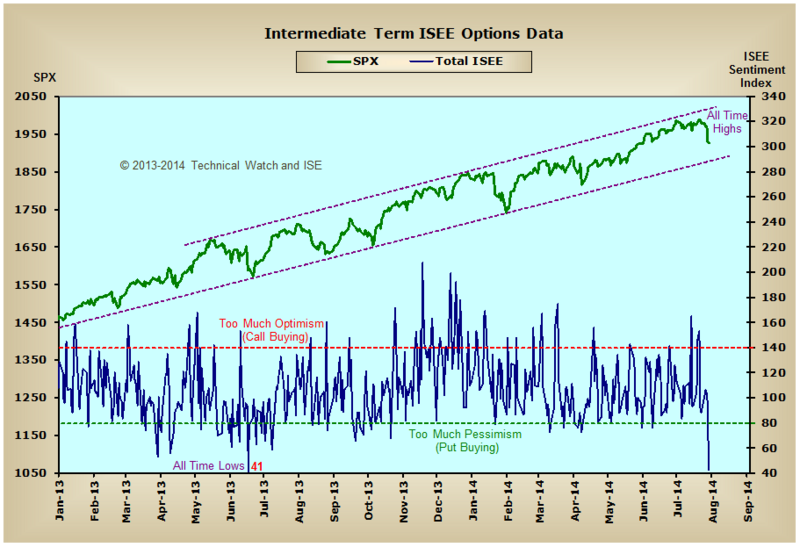 The ISEE put/call ratio index moved from a 69 reading on Thursday to a 43 reading on Friday which is the lowest level since the all time lows of 41 that were generated on June 20th, 2013. The SPX was down some 41 points on 6/20/13 compared to Thursday's 39 point decline. The NYSE breadth ratio on 6/20/13 was also overwhelmingly negative with a 170/2976 plurality compared to Thursday's 309/2888 ratio. The price decline of 6/20/13, and this past Thursday's decline, both broke below their rising 50 day exponential moving averages. The 6/20/13 decline came when Ben Bernanke made first mention that the FED may start to taper their bond buying later in the year. Thursday's decline came a day after the most recent FED's policy statement which continued to suggest that their tapering program will be complete by October of this year. The Volatility Index (VIX) was up some 23% on 6/20/2013 while Thursday saw a one day gain of 27%. Both periods had the CNN Fear and Greed Index in "Extreme Territory" with Friday's reading of 5% at its lowest levels since the price lows of October 2011. Two days after the 6/20/13 ISEE low the SPX bottomed (with a negative breadth plurality of 418/2705) and had rallied some 431 points on an intraday basis, or just shy of 28%, before Thursday's and Friday's pull back. Thanks for bring this important comparison to our attention. Given the points you have mentioned regarding the ISEE, how would you reconcile it with the various MCO breaking the Feb lows of this year and the message it sends that it might take at least a couple of weeks if not a month to find a base to rally out of vs. the more immediate V shaped bottom the extreme fear indicators might suggest. Are there any clues that might suggest to the trader how quickly a bottom and bounce might form? Much thanks and have a great weekend. Nice job setting up the lay of the land for a comparison of the last time the ISEE index dropped into the low 40s, a significant extreme for the series. A couple months ago, Darris (TW member) and I came up an idea to scrape the daily put-call data for the constituents of OEX (100 stocks) and SPX (500 stocks) from the OCC. The OCC daily data does not include buy-to-open (BTO) put and call data, but does break down the put and call volume (BTO, STO, and closing position volume) for retail, market maker, and firm transactions. The chart below is the retail only put-call ratio for all of the SPX components. The OCC only maintains a two year data base for all of its statistics, thus the chart only goes back 2+ years. However, one can still access data for stocks that have gone private, so we were able to include stocks like DELL, HNZ and other former SPX components that have since not traded publicly to maintain accuracy. Note the the Friday August 1, 2014 SPX constituent PC ratio spiked to 1.23, by far the highest PC ratio in this limited series' history. There were three SPX components, CMG, PCLN, and REGN that had unusually high put volume Friday. 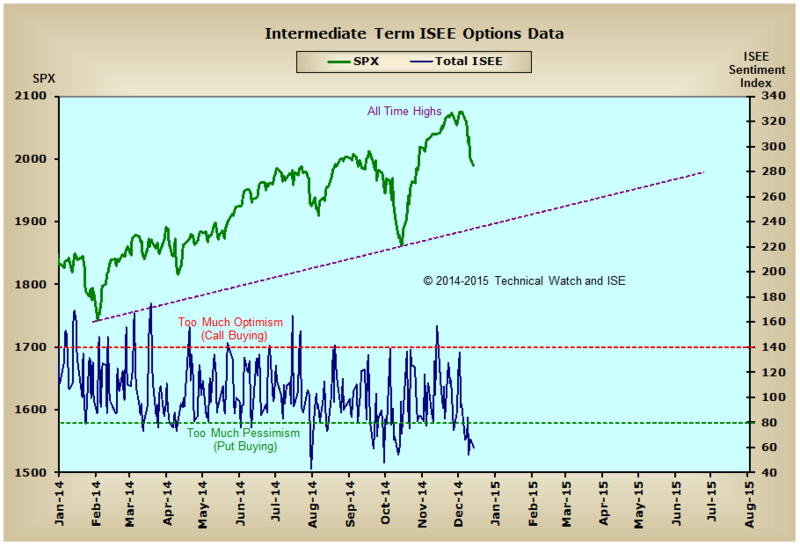 Thus, the ISEE was the only options indicator reaching extremes Friday. The SPX constituent PC ratio extreme does not guarantee an important bottom, but does suggest the retail options traders are jumping on the bear side of the boat. thanks Dave and Randy for the thread and good info. cheers to you all for continuing the work here! Rather than start a new ISEE thread I thought I'd append this here. ISEE equity-only call/put registered back-to-back days below 100 - a relatively rare occurrance. (he missed this yr's Oct 13-14 hit, 80 & 78 respectively). Adding to that, the total ISEE numbers have been below 80 since December 4th. In fact, the 5 day SMA moved to a reading of 67 on Monday, the 8 day to 73...both an all time low. Here's the latest total chart as of Monday. Thanks for the cross post!